International property developer, Poly (Australia) Real Estate has had its second successful launch of apartments at its Poly Horizon development in Epping. Poly secured approximately $41 million worth of apartment sales in Stage 2 comprising 51% of all 100 released apartments. Last week's interest rate cut by the Reserve Bank of Australia, which is soon to be passed on to consumers by most of the major banks, further buoyed apartment sales at Poly Horizon’s second launch at Epping. Poly Marketing Director Philip Best commented that the recent budget decisions around Self-Managed Super Funds and the RBA interest rate drop has helped continue to bolster the Sydney property market. “Poly made the decision to only release 100 apartments for this launch as we believe the market will further strengthen in coming months and felt it was prudent to hold back stock to respond to the expected strengthening of the residential property market,” Mr Best said. 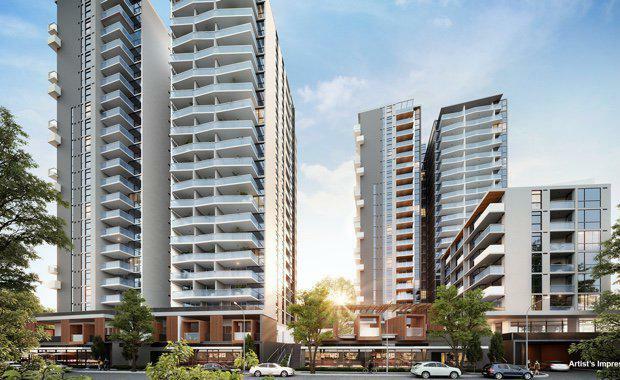 Located on a prime elevated corner site of Oxford and Cambridge Street, Epping, the $344 million mixed-use precinct, will comprise of 501 spacious apartments across one 22-storey tower, one 21-storey tower and a third low-rise tower. Designed by internationally acclaimed architects, PTW, the ambitious project will set the benchmark for apartment living within the Department of Planning’s revitalisation plans for the Epping Town Centre. The towers will feature a striking reticulated façade that will create a dramatic architectural statement for the surrounding area. Apartments are positioned to take advantage of the breathtaking views to the CBD and North Sydney skyline, and the Blue Mountains to the west. Poly Horizon’s generous balconies, floor to ceiling windows and large open-plan living spaces have been designed to create a stunning combination of indoor and outdoor living. Potential buyers queuing at the launch of sales for stage two at Poly Horizon in Epping[/caption]At its first launch only weeks earlier in March, Poly sold 83% of the released 235 apartments, selling more than 90% to buyers who lived locally. Poly is also developing two other mixed use projects in Melbourne and is soon to develop two other developments in St Leonards on Sydney’s lower north shore, and in Werrington, near Penrith in Sydney’s west. CBRE Residential Projects Senior Director, Tim Rees, said the overwhelming demand for the project’s first stage meant that it made sense to fast-track the launch of Poly Horizon’s second stage by several months. “It’s been pleasing to see a large number of interested buyers who missed out on securing an apartment in the first stage of the project, successfully purchase in the second stage. We’ve even had several purchasers who have purchased in both stages which tells us buyers are eager not to miss out on launch prices,” Mr Rees said. “Poly Horizon is comparatively competitively priced with studios starting from $420,000. Many buyers who are doing their research and looking at multiple competing projects across Sydney’s northern growth suburbs, are finding this price point highly attractive. “We’ve seen a huge level of interest from local families and first home buyers familiar with the convenient lifestyle offering of Epping, who were keen to take advantage of the State Government’s plans to revitalise the Epping Town Centre. Poly’s highly anticipated second stage will also feature 1000sqm of ground level retail including a proposed childcare centre and a huge 3,500sqm of community and open green space. Mr Rees added that the project’s close proximity to a wealth of local amenity including major regional shopping centres, schools and universities, health and lifestyle facilities has proven a major drawcard during to buyers in the first and second stage. Poly Horizon is located only 300 metres from the recently refurbished Epping rail station, a five minute walk to the Epping Town Centre, a few minutes’ drive from the M2 motorway and only a 25-minute commute to the Sydney CBD.